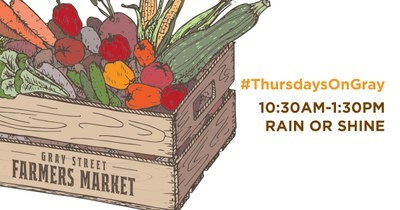 The Gray Street Farmers Market (GSFM) will be open from 10:30 a.m. to 1:30 p.m. every Thursday from May 16 through October 31, 2019. 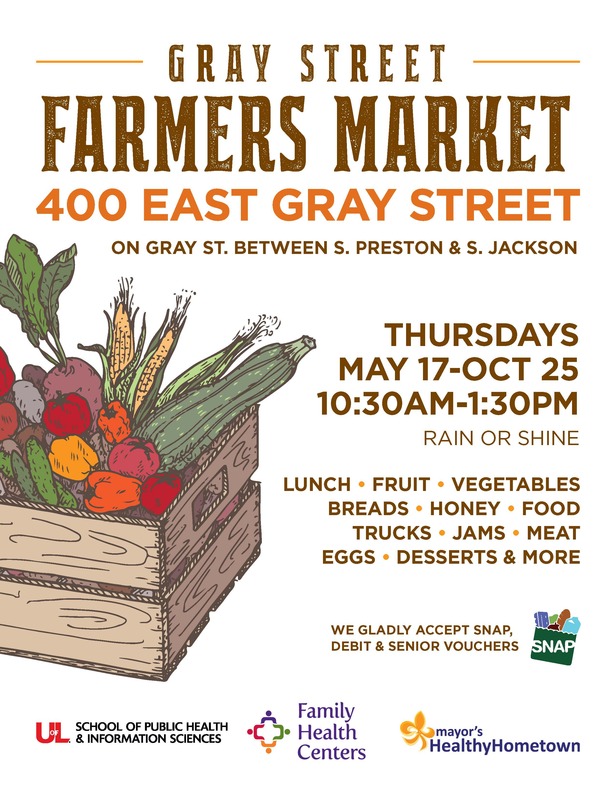 The market is located on the 400 block of E. Gray Street, between S. Preston and S. Jackson streets. Click here to get directions. Check out our wonderful vendors who sell the finest in local farm products including fruits, vegetables, breads, honey, canned goods, lunch items, crafts and more. Debit cards and SNAP benefits are accepted. GSFM has launched an Elevate crowdfunding campaign to grow and expand its SNAP Dollar for Dollar program. To learn more or help support the program, click here. The Gray Street Farmers’ Market began in 2009 as an outreach program of the UofL School of Public Health and Information Sciences. The goal of the market is to increase access to fresh, locally grown food in the downtown area. GSFM partners include the Louisville Metro Department of Public Health and Wellness, UofL Health Care, Family Health Centers, and the Louisville Area Chapter of the American Red Cross. These organizations have representatives on the market governing committee. Click here to learn more about other markets in Louisville. Click here to get answers to Frequently Asked Questions (FAQ). Visit the Gray Street Farmers Market YouTube channel to access several videos. Find the GSFM on Facebook, Twitter, and Instagram .